The link between the families began in 1867 when Edwin Newman's only daughter Henrietta married Henry Paynter in London in 1867. Ray Farnsworth records that their marriage certificate shows Henry's address as St. Paul's Alnwick, so he must have moved up there before the wedding. It remains a mystery why he chose to work (or was sent to work) so far from his ancestral home in Cornwall. Henrietta's mother was Charlotte (nee Jekyll), first wife of Edwin Newman, who died in 1876. Edwin subsequently married Henry's mother, Catherine Augusta (nee Coleman). Thus Henry Paynter became both Edwin Newman's step-son and son-in-law! 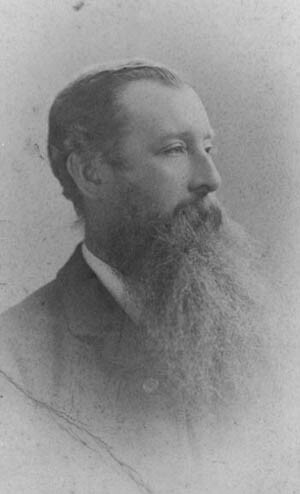 In the late 1870s, Henry's brother James Bernard Paynter joined Edwin's law firm, becoming a partner in 1881. On Edwin's death, he became senior partner in the firm buying Hendford Manor from Edwin's estate. The connection between the families continued for another generation when Henrietta's nephew Walter Ernest Newman (my grandfather) married his first cousin, Henry's favourite daughterLilian Jekyll Paynter. The 1861 census shows Henry (aged 15) at boarding school in Truro with his brothers John de Cambourne (16) and Charles (18). Beyond that, I know nothing of Henry's early life, but it seems that he was sent off to Alnwick in Northumberland to work in a law firm owned by a Mr Foster. Then in April 1867, at the age of 20, he married Edwin Newman's only daughter Henrietta (aged 17). After the wedding, the couple travelled back to Northumberland where Henrietta gave birth to her first baby Kate in the coastal village of Almouth in early February 1868. 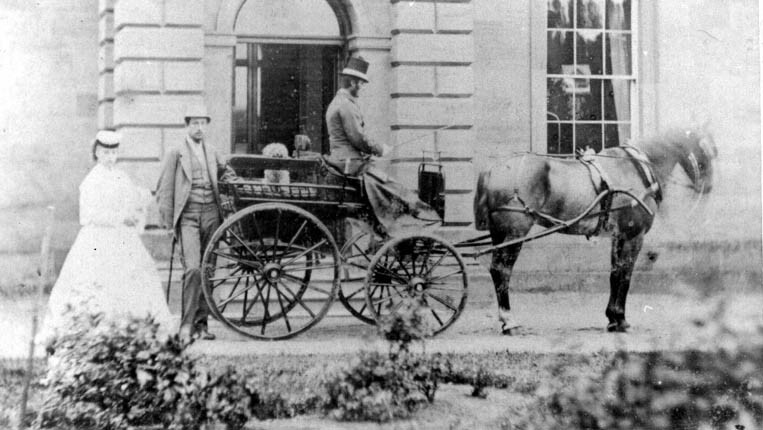 Later that year (in October 1868) Edwin Newman travelled up to Alnwick where he bought the house Freelands and settled the young couple in it. At some stage Henry entered into a partnership with Foster, the firm Forster and Paynter being located in the town centre of Alnwick (see separate page). Henry and Henrietta lived at Freelands where they spent the rest of their married life (45 years) and produced 12 children over a period of 32 years. Over the years, Henry established himself amongst the local gentlefolk and became well known in the district - he and his brother John de Cambourne Paynter, who subsequently joined the law firm and lived at the nearby Belvedere, being known for their long beards. Henry's interests extended well beyond legal affairs, and he developed a keen interest in shooting and fishing, golf and other outdoor pursuits. It seems he had a passionate interest in wild bird life, and was involved in the bird sanctuary on the Farne Islands, where the family would visit when on holidays (photo left). Henry also had a financial interest (and directorship - see photo below) in a local colliery in the nearby village of Shilbottle where he used to walk each Sunday to read the lesson in the local church. For all the 50 years that he lived at Freelands, Henry never owned the house. 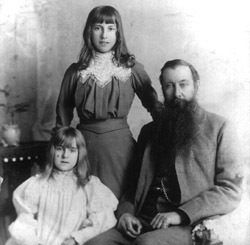 On his death, Edwin Newman placed it in trust for Henrietta for the duration of her life. This I believe, caused minor embarrassment when he tried to sell off part of the land and it was discovered that it was not his to sell. Ray Farnsworth (who lived at Freelands for many years) told me that Henry stayed on at Freelands four about four years after Henrietta's death in 1914. Ray thinks that his (only) unmarried daughter, Eva, stayed on with him, after which the house and land was sold to Capt Gray (Merchant Mariner) in 1918 for £3000. Henry then moved back south and died in Somerset in 1919 while staying with his brother James back at Edwin Newman's old home in Yeovil (see below). Marion Paynter told me (in 2001) that Henry's sons Ernest and Jum trained as lawyers but were made to work for their father for nothing. They eventually revolted and "fled to freedom" in Canada. She added that according to Jum, Henry and Henrietta argued incessently about money - and that suitors visiting the girls had no idea of the parlous state of the family's finances. Henrietta never had enough money for housekeeping or for the entertaining that they indulged in, nor for the charities that she supported. Edith has a lot to say about her father in her wonderfully colourful reminiscences of her childhood which she wrote late in life in 1974 . These are reproduced at the bottom of her page. "My grandfather stood six foot three inches in his socks, sporting a huge spade beard which repelled me at the good-night kiss, smelling as it did of whisky and tobacco. He was a strange character. Years later when I was grown up, my father told me that he was a master of sarcasm such as to drive his largely uneducated sons from the home at the first opportunity, whereas on the other hand, his popularity with and hospitality to his elders and contemporaries prompted so many legacies that he should have died rich had he not been profligate and seldom out of debt. That is as may be. The Duke (of Northumberland) was among his clients and he thus enjoyed some privileges including access to fishing and shooting rights, sports at which he was notable proficient. He also enjoyed the keys to Alnwich Park ...."
He goes on to describe Sunday hypocracies: "On the Sabbath, Day thou shalt do no manner of work ... thy manservant, nor thy maidservant not thy cattle etc. I can vouch that the maidservants toiled, but the cattle here included horses and ponies and they were strictly protected from Sabbath labour. ..... In parenthesis, I also learned that Henry Paynter crowned his Sunday austerity after supper with three or more male cronies in the smoking room at a whisky and whist session. (He kept a chamber pot behind a folding screen, not to mention two spittoons on the floor. That I do remember)". Ian Caldwell writes a similar story about Henry as follows: "Henry Augustus Paynter (1846-16/5/1919), son of Francis Paynter and Catherine Augusta Coleman, married Henrietta Newman (d.1914) on 11th April 1867 at St.George's Church, Hanover Square and they had 12 children, 8 girls and 4 boys. Henry was born on 2nd April 1846, probably in Marazion, Cornwall. Henry practiced as a solicitor in Alnwick, one of his clients being the Duke of Northumberland who allowed the family the use of his grounds as he had given them a key to the gate. The Percy Hunt would meet in front of Henry¹s house, Freelands, and my grandmother enjoyed following the hunt and was delighted when she was given the brush. Henry had a half share in the Shilbottle Coalmine. He and his brother, John, both had beards and both liked country pursuits. At first the family were relatively well off, but Henry stood surety for a man who defaulted and also lost money which he put up for one of his sons on a sawmill that burnt down. (See also note below.) With twelve children to support the families fortunes declined. Henrietta was concerned for the poor and produced coins for "penny Dinners" which were distributed to those in need. They could be redeemed for food at Alnwick Cocoa Rooms. She also rented a house in Alnmouth to be used as a Fisherman¹s rest, where fishermen away from home could have a comfortable refuge and some family furniture and the billiard table were sent down to Alnmouth for these men - (my grandmother regretted the billiard table going). Henry died on 16th May 1919 and was buried at Lufton, Somerset. His mother, Catherine, married his wife's father, Edwin Newman, after their spouses had both died, in 1876, which was how his brother, Bernard, came to inherit Hendford Manor. Ray Farnsworth, who lives at Freelands, Alnwick, now has a web site for the history of his house at www.freelandsalnwick.com - and Lilian¹s grandson, Chris Newman, who lives in Beijing, has a website for the Newman family. (Lily married her cousin, Walter Newman) and Chris's site is http://newman-family-tree.8k.com/. "Notice is hereby given, that the Partnership heretofore subsisting between us the undersigned, Alfred Oswald and Henry Augustus Paynter, carrying on business as Timer Merchants and Saw Mill Proprietors, at Pallion Saw Mills, near Sunderland, in the County of Durham, undert the styles of Alfred Oswald and A. Oswald & Co., has been dissolved, by mutual consent as to and from the day of the date hereof. All debts due to and owing by the said late partnership will be received and paid by the said Henry Augustus Paynter, who will continue the business. Dated this 22nd May, 1886. Alfd. Oswald, Hy. A. Paynter"
Ray Farnsworth wrote, "I stumbled on a bit of interesting nonsense while browsing through an 1890 Edition of a Northumberland Directory. I easily found a reference to Henry Augustus Paynter as A Solicitor of Forster & Paynter of Fenkle Street, Alnwick. (this building also has an entrance in The Market Place.. I also found him as proprietor, 'Garwood and Paynter', of the Shilbottle Coal Co. He is also listed as "Steward to the Courts Baron of Wark and Wooler". The Courts Baron were an ancient, mediaeval feature and, although essentially not in use by 1890, were held probably a couple of times a year to deal with petty matters of Debt etc. The Steward would hold the Court for the Lord of the Manor (i.e. the Duke of Northumberland). By 1890, the Steward would normally be a Solicitor." "Lufton is a small Somerset parish about three miles west of Yeovil. According to the Western Gazette of 30th May 1919 (Yeovil edition, p 4), Henry Augustus Paynter was on a visit to his brother, James Bernard Paynter of Hendford Manor, Yeovil, when he died aged 73. The obituary stated that Henry Augustus was 'a solicitor with a large practice, but was also prominent in the hunting field, a regular golfer and an expert angler. He took a keen interest in the protection of wild birds and established an extensive bird sanctuary on the Farne Islands (off Northumberland) which he was lessee. He was part owner of the large Shilbottle collieries, but had recently sold his interest in that undertaking'. It seems likely that he was born in Penzance, Cornwall". When I visited Lufton in 2001, the weather was bad and darkness was approaching, and I was unable to find the church where Henry is buried. The map below shows it at on a small dead-end road close by the A3088 road just outside Yeovil. Five of the Paynter brothers can be seen in the photo below, taken at Freelands in 1875. 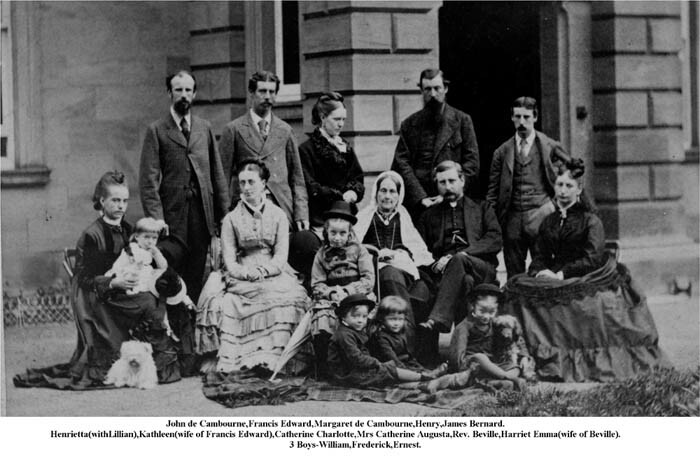 James Bernard (back right), Henry (next to James), John de Cambourne (back left), Francis Edward (next to John), and Rev Beville (seated, middle row). 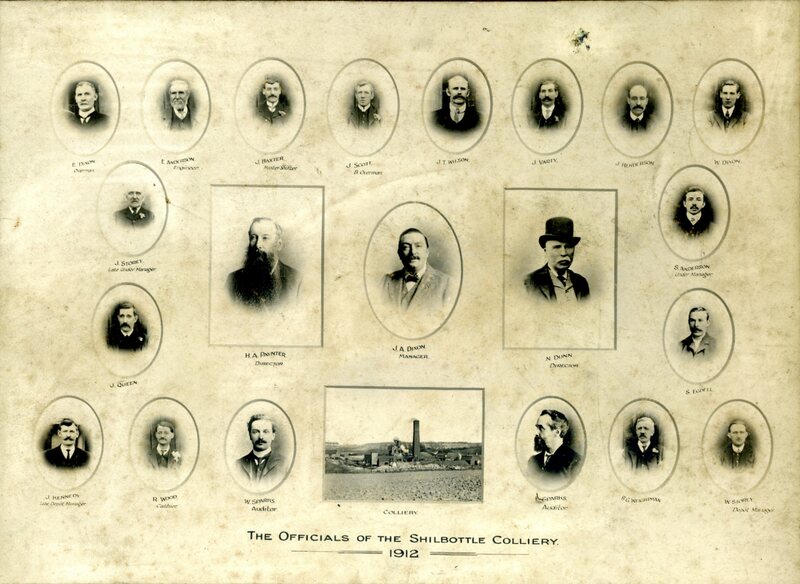 Below is a montage of the Shilbottle Coal Mine officials dated 1912, sent to me by Ian Caldwell on 5th March 2008. The photo was given to him by his aunt Betty Ross. For a larger image of the photo, click here. Last updated: 5th Aug 2013 - detailed corrections including deletion of reference to Francis Paynter once being a partner of Edwin Newman. Updated: 5th May 2008 - photo of Shilbottle officials added.